As a tool to communicate science, astronomy possesses aesthetic and inspirational strengths that make it a compelling conduit for science awareness. Astronomy touches on philosophical questions of great import, including the origin and destiny of our species and the uniqueness of life in the Universe. Space stimulates the human imagination: a superficially peaceful, yet violent arena with exotic phenomena that are counter-intuitive, spectacular, mystifying, and engaging. The science of astronomy moves quickly and delivers new results on a daily basis. For all these reasons, astronomy can lead the way for other natural sciences and be a frontrunner for the communication of science in general. In a fast-paced connected world, public astronomy communication must follow the pace of the other players in the electronic information mass market, particularly the gaming and entertainment industries. The problem today is not so much the availability of excellent astronomy multimedia resources for use in education and outreach, but rather suitable access to these materials. Both public and professional sectors need better access to images and videos of stars, galaxies or astronomical phenomena. The idea for VAMP originated to address a need recognized by visualization and communications experts. The daily frustrations of these professionals in locating visual astronomical resources highlighted the lack of any real access and metadata standards across the board. The appeal of developing a sophisticated ― "one-stop shopping" portal is enhanced by the potential it has to promote access and interest in the field, as well as to become the foundation for future innovative Web 3.0 ― "Data Web" style application development. Once designed and built, VAMP will allow observatories and others to ingest any future resource that conforms to the suggested standards and make them immediately searchable. The primary deliverable of VAMP is a database server that indexes, searches, and serves out standardized metadata and education/public outreach image file locations of the world‘s research observatories and telescopes. VAMP will utilize the International Virtual Observatory Alliance (IVOA) endorsed outreach metadata standard, Astronomical Visualization Metadata 1.0 (AVM) and help support observatories in adopting and adhering to these standards. This metadata preserves the descriptive context of the imagery that astronomers and communication professionals have laboured hard to create. The standard includes both the metadata schema for describing outreach images and the method by which the metadata may be embedded within the image file. For data-derived images, full World Coordinate System (WCS) tags can be used to describe fully the position, orientation, and scale of the image while allowing for a variety of applications requiring the full coordinate context. VAMP database tools can answer queries utilizing the full extent of this encapsulated metadata allowing for more powerful search capabilities than any existing today for astronomy. Facilitating the adoption of this standard is a necessary element of VAMP and will ensure that astronomy imagery takes the lead in web convergence technologies. VAMP will provide innovative developers with a tool for simple, standard access to outreach imagery and media from a variety of sources, thus encouraging the creation of the cutting edge applications that today‘s technological public demands. In addition, VAMP will design and implement a public friendly interface to the database for the ―every person‖ who is in search of EPO products. In conclusion, simpler access to astronomical imagery for multimedia and web developers means that more people will be exposed to astronomy and its observatories, space missions and science. More people inspired by the world‘s greatest observatories means a better understanding of the overall importance of astronomy, space science, and the exploration of new worlds. This project will benefit teachers, press, scientists, EPO specialists and inspire laypeople and students, our future scientists and engineers. Astronomy is considered to be the oldest science, yet it remains among the most vigorously advancing disciplines with a constant stream of fundamental discoveries. Through the ― "eyes" of space telescopes and probes, equipped with cutting-edge electronic instruments, we have traveled to other planets of the Solar System, determined the shape and structure of nebulae, measured distances and the composition of distant galaxies, and continue to revolutionize our understanding of the origins and ultimate fate of the Universe. The engagement of astronomy enters our lives at many levels. The simple progression of day and night through the seasons proceeds from the Earth's axial tilt as it orbits the Sun. The tides harmonize with the Moon‘s and Sun's locations in the sky. Careful measurements of the positions of stars have guided sailors to their destinations for millennia. And today, the rich and growing galleries of astronomical imagery continue to engage and interest people in the Universe and their place within it. Astronomy is very much a gateway for general science interest, in part because of its intrinsically visual nature. Arguably, it is the instantly engaging imagery that can capture the hearts, and ultimately minds, of even the most science-illiterate public. The Hubble Space Telescope has become a household name not because of its impressive record of scientific achievement, but because it has provided some of the most popular and spellbinding images of the Universe. Communication professionals have created a variety of media to explain such challenging topics, and indeed, people deserve to have easy access to the media that can help illuminate concepts that affect their daily lives. Astronomy and science communication in general will benefit from facilitating the retrieval and acquisition of space imagery — especially with its associated interpretive materials. Today, science education evolves against a backdrop of increasing ― "Web 2.0/3.0" interconnectivity. Increasingly the metaphor for communication and learning moves away from the linear and structured to a more free-form sense of exploration and interactive discovery. This new era of web development is built around models of the interoperability of resources that rely on the standardization of resources. Opening the vast library of astronomical imagery to the future of web development hinges on forward-looking designs for services that can foster entirely new environments for science engagement and education. It is critical to put the necessary infrastructure in place to make astronomy imagery accessible in a way that it maintains its educational context. This is the goal of the Virtual Astronomy Multimedia Project. 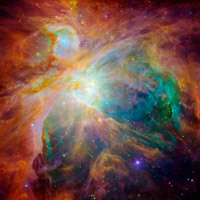 Images and other multimedia resources are the primary product of astronomy in the eyes of the public. Likewise they represent the most powerful hook for Education and Public Outreach (EPO). Yet even with the latest and greatest web connectivity tools, access to such visual resources is at best haphazard. Consider the realistic example of an educator searching for images of a specific galaxy for a brochure on astronomy. The idea would be to compare several different views of the galaxy from different observatories. How could this imagery be obtained? One approach would be to go to a web search engine, type in something like ― "M51 Galaxy" and look over the resulting pages of ― "hits". Even with image-specific engines the results are unsatisfactory. There will likely be dozens of copies of one or two of the most popular images that appear repeatedly on many websites. But usually it will be at low resolution, intended for on-screen and useless for print or broadcast work. Moreover, finding the source site with the highest quality images and the original caption text, may be difficult as it would be buried amongst dozens of other superficially similar results. Additionally, some other useful examples may not show up at all because they were written up as the ―Whirlpool Galaxy‖ or because there was no searchable text on the page with the name. Returning to the example, an alternate approach to identify the relevant ―M51 Galaxy‖ imagery would be to search the sites and galleries of a set of individual observatories and missions individually. Alas, each site utilizes a different organizational scheme and requires some expertise to navigate quickly and efficiently. The process of locating a specific image can prove daunting, and exploring the archives to find something new becomes quite time-consuming. Moreover, even a trained astronomy education professional is not likely to know every possible observatory and gallery. Many viable images would be missed entirely, especially if they come from new or smaller facilities. A targeted search excludes the possibility of serendipitous discovery. 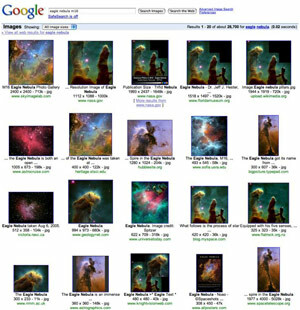 Example: Nine of the top twenty Google Image hits for ― "Eagle Nebula" are of the same classic Hubble image, but none of them point to the ― "home" web page for the image. 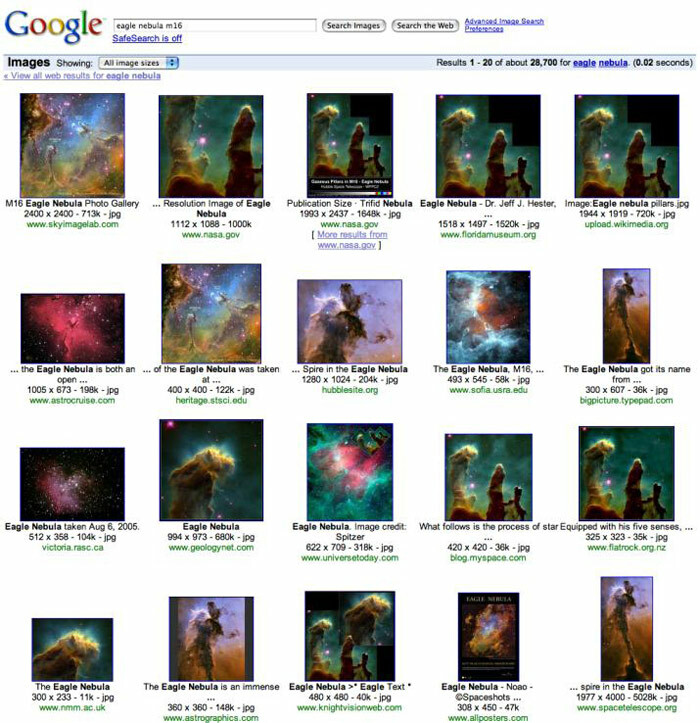 The one Hubble image continues to represent about half of the available hits for many pages of search results, effectively ― "burying" relevant images from other observatories. The problem will only intensify over time. Just as most scientific disciplines are currently experiencing a ―digital data flood‖ of exponentially expanding datasets, so too are outreach and education multimedia resources multiplying rapidly. More and more ― "polished", public-friendly materials are being made available to press, educators, and lay people on the web. Vast quantities of value-added outreach material are already available on the web today, but they are not linked systematically, and it is therefore next to impossible for the press and public to search these resources in a simple manner. The explosion of multimedia astronomy resources necessitates practical strategies for intelligent indexing. Even casual photographers are using applications that tag the images with associated metadata (wavelength, telescope, dates, subjects, captions, locations, ratings, etc.). The rich contextual information associated with astronomy multimedia could be a valuable asset in locating desired resources if it can be encapsulated using universal standards. The absence of an agreed standard for astronomical imagery descriptors dissuades and inhibits innovative developers from using astronomical imagery from many different wavelengths/sources. New methods for accessing and integrating images would have to be developed for each resource. Furthermore, access to the imagery and data may not be uniform over time. The goal of the Virtual Astronomy Multimedia Project is to develop, implement, and promote critically needed metadata standards, and to provide online resources for finding imagery adhering to these standards. The Virtual Astronomy Multimedia Project (VAMP) will provide an innovative and powerful portal for accessing the broad cross section of astronomy visual imagery resources. The vision is for a ― one-stop shopping‖ experience for all levels of end-users who are seeking images that also provide the basic infrastructure upon which a variety of derivative applications serving any number of audiences can be based. This challenging task demands consensus and collaboration among the entire EPO community – from the image-processing specialists creating the ― "pretty pictures", via the outreach archivists, to the variety of end-users such as educators and innovative web developers. The aim of such a system could be stated as: ― To allow EPO resources to be 'catalogued' in a virtual repository and accessed by educators, press, students and laypeople through specialized visual tools combined with innovative search "strategies". A museum professional gathering source material options for exhibit development. A publisher looking for print-quality images of a general phenomenon to illustrate an article. A teacher seeking related images in different wavelengths kept in context for her students. An innovative website or application that needs to access web-resolution content on-the-fly in response to changing context provided by user interaction/exploration. A digital planetarium system that issues a real-time query to locate any high resolution imagery to map into a zoomed-in region of interest. A scientist looking for comparative images at a different wavelength from their own research. 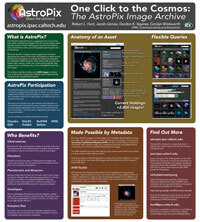 VAMP will serve as a sophisticated image source for educators, museums, media & print, astronomers and the public. Some of this potential can be accessed directly through the database interface, but its greatest advantage is the potential to form the basis for interactive and dynamic Web 2.0/3.0 experiences that are developed as client applications. The VAMP architecture for interactive application interaction follows current trends in distributed web resource management. The image archives reside on their native servers at a variety of sites registered with the VAMP database server, and provide their content via web-accessible metadata indices. Initially the focus will be on integrating the largest key observatories, but the simple web-based ―"buy-in" process can easily accommodate smaller institutions and amateur observatories that follow the AVM standards. the search technologies employed to serve out the locations of the images and accompanying metadata. Institutions and galleries wanting to participate in VAMP will make the image collections that have been tagged with fully descriptive metadata available at the server level. Push and pull methods can be utilized by VAMP in order to collect the metadata and locations for these images as they become available or as changes are made. In response to queries for imagery VAMP returns the descriptive information and links to the original image resources. It should be noted that VAMP is designed specifically to encompass the ― final product‖ imagery that is a natural result of press release development and other outreach activities. 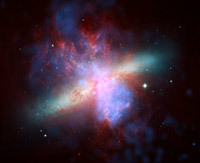 These will be the polished images with the greatest aesthetic impact from the Chandra X-Ray Observatory, Spitzer Space Telescope, Hubble Space Telescope (STScI), Hubble Space Telescope (ESA), National Optical Astronomy Observatory, and the National Radio Astronomy Observatory. These observatories have already endorsed the VAMP effort and some have begun tagging EPO images. Future scalability will include promoting the VAMP vision and goals to all other recognized astronomical observatories and telescope projects with EPO imagery. An image on a website is only as informative as the text that happens to lie near it. VAMP will greatly enhance the value of these assets by tagging astronomical imagery following the Astronomy Visualization Metadata (AVM) standard. This includes key information such as sky coordinates, descriptions, common name, and subject matter (using a standard taxonomy). The International Virtual Observatory Alliance (IVOA) has already endorsed the AVM standard, but it has not gained worldwide recognition partly because of lack of visibility, and partly because of the lack of resources to generate the necessary ― "momentum" in the community (a well-known obstacle for all standards in the starting phase). The scope of AVM is specifically tailored to public-friendly astronomical images, allowing systematic indexing of source material even for complex multi-colour composites from multiple observatories. However it also encompasses artist‘s concepts and diagrams, simulations, and photography. Ultimately it could be extended to cover a broader range of multimedia resources like videos, podcasts, and so forth. The first phase of VAMP will focus on astronomical imagery and will underpin a larger future effort encompassing all multimedia products related to astronomy. AVM tags are based on elements from two key standards, tailoring them to the specific needs of outreach-style imagery. The International Press Telecommunications Council (IPTC) has a recommended set of metadata tags for describing photography assets for use in the publishing industry. The IPTC tags are commonly embedded directly within image file headers using Adobe‘s Extensible Metadata Platform (XMP), and such tags are used by virtually all media management software packages. Where possible, AVM tags are mapped directly into established IPTC fields to be immediately accessible within these common packages. The IVOA also has a set of metadata descriptors specific to astronomical datasets. AVM follows these conventions as appropriate. A number of extensions have been defined to address the needs of the outreach community further. Full World Coordinate System (WCS) tags can be used to describe fully the position, orientation, and scale of the image while allowing for a variety of applications requiring the full coordinate context. Libraries of images with WCS coordinates can be used in many ways independent of VAMP: Simple Image Access Protocol (SIAP) server for positional queries, Virtual Observatory (VO) integration etc. The ancillary benefits of utilizing a standard set of metadata in the community is that image archives with AVM tags will be directly useful to publishers and casual users with media management software due to AVM integration with standard ― "photographic" IPTC/XMP metadata tags. The VAMP database server will be developed by the Infrared Science Archive (IRSA) at the Infrared Processing and Analysis Center at Caltech., IRSA has provided data access for the astronomical community since 2000 and has built archives under contract for the Cosmic Evolution Survey, the W. M. Keck Observatory and the NASA Stellar and Exoplanet Database (NStED). The IRSA physical archive now houses data from 12 missions; the holdings include over 200 source catalogs, over 10,000,000 images and over 100,000 spectra. IRSA‘s web services have received over 25 million hits since 2000, and users have downloaded nearly 60 TB of data. IRSA takes advantage of a highly re-usable information system designed to serve the kinds of data used in astronomy and has no dependence on the wavelength regime. This system consists of re-usable, portable components, written in ANSI-compliant C, that perform the tasks needed to query the archive and return results, such as composing queries and submitting them to the database, filtering tabular data sets, and building webpages from templates. User interfaces are simply thin layers that accept requests and submit them to the infrastructure underneath. New applications plug together these components and control them with an executive library, which starts the components as child services and parses the return values. New functionality is written as needed and is always integrated into the architecture. Thus IRSA provides access services for all sky missions, observatory missions, and targeted surveys. Based on the concept of a 'virtual observatory', the primary deliverable of VAMP would be a digital library that stores, organizes, and delivers metadata on imagery for astronomy and planetary sciences. Distributed databases will store the metadata and online location of each image/media file on the content provider's server. A push/pull communication system between the middleware and observatory servers will manage the influx of metadata to the system. Those wishing to utilize VAMP will subscribe to a web service that communicates directly with VAMP to deliver the metadata and location of the image/media file directly into their applications. The web service will be a simple search engine that will employ many search strategies: metadata filtering, keyword searches, and ― "intelligent" related content services based on well-designed taxonomies and thesauruses. The core of the VAMP system will be one or more searchable database tables. These tables will contain all the metadata fields suitable for relational searching (e.g. "ObsDate < 1950." or "Wavelength = IR"), positional searching (e.g. "within 5 degrees of M51"), or keyword/string matching. The data itself is separate from the metadata contained in these tables. The connection will be URL references in the metadata. The data may be simple URL-accessible files, parameterized links to services, or even higher-level references to redundant copies of the data. Database updates can be made both in push and pull modes: data suppliers can upload metadata at random to be ingested or the facility can collect data from registered suppliers on a regular basis. When there are multiple instances of the VAMP database service, they will also be able to harvest updates from each other. Under any of these scenarios, the data will need to be vetted. For trusted suppliers, this will be nothing more than a validation of the success of the transfer but for less well-known sites this may involve some manual quality checking. While initially there will be focused effort to consolidate information at a single site (critical mass for initial operations), the architecture will allow for distribution of this metadata across multiple sites. This allows for extension by sub-discipline, load balancing across redundant copies, and backup/failover. A key element of the database server will be user query forms that can be used for direct queries to the holdings. The real potential exists, however, in the power offered through such a flexible online catalog. The VAMP search services will most likely be built in compliance with the international Virtual Observatory Table Access Protocol (TAP). Though this is still under development, it is clear that all necessary functionality will be included. In addition, where more complex textual descriptions or fully-populated keyword taxonomies exist, this may be augmented with more free-form "meaning"-based search engines. TAP is content neutral (no specific table columns are pre-defined), so VAMP will still need to set its own schema. This will be a minimum set; it will be possible for specific instantiations of a VAMP database service to extend this schema with information pertinent to a subset of images. Low-Level Searching will be via the TAP protocol, which includes all the generic relational queries and spatial constraints. This is functionally equivalent to the spatial/relation query engine already in use at IRSA, so the queries and query throughput measures are well understood. High-Level Searching, the interfaces with the actual users, will be implemented as form-driven web pages (users desiring program-friendly interfaces can use the low-level services directly). The form-driven interface will be in direct response to use cases defined by on-going interaction with the user community. There may be more than one key scenario here, but the structure of the data and low-level services make it easy to evolve these quickly as needs evolve. All images of a specific object that include one or more specified wavelengths. Any emission nebula observed by a specific telescope. Images that are of high resolution covering a specific range of coordinates on the sky. Images with caption text matching specific search terms. The VAMP database server is truly intended to be ― middleware‖ and not a stand-alone user experience. It will, however, enable a broad variety of high-level applications that are designed to create user-friendly experiences to explore astronomy imagery in many potentially innovative ways. "Applications" are defined as any internet-based process that can issue queries to the VAMP server and can parse the match results. Queries can be broad or highly specific, and can cleanly specify any number of astronomy-specific descriptors including coordinates, field of view, observatory, spectral band or specific wavelength, etc. Flags can be set to indicate desired media type, which can include any combination of astronomical image, illustration, simulation visualization, and/or photograph. The VAMP query will generate a table of metadata descriptors of assets matching the search criteria. The key descriptor will be a URL of the actual image at whatever content provider site it resides. The VAMP server will not maintain copies of all of the assets; it merely manages the metadata and information about the location of the resources in much the same way Google searches return links to the original sites. The client application can take these resulting matches and either resubmit a refined query, or use its own logic to determine which of the assets it will utilize directly. It then downloads the image using the provided link from its home server; the VAMP server only manages the metadata and does not hold the image files itself.